Hello Everyone, this is my second post for today, please scroll down one to find my DT piece for FSC. As you can see Vintage is the theme this week at the PanPastels UK Challenge blog and I have created a card using a fabulous Crafty Individuals stamp CI-056, coloured with PanPastels - turquoise shade, phthalo green, magenta, raw umber and titanium white. I sealed it with spray and shine. I ran a piece of card through the Damask embossing folder and again swiped magenta and white PP over it and layered everything with some vintage elements and flowers. We would love to see your vintage art this week and you do not need to use PanPastels at all, but if you enter you stand a chance of winning a fabulous set of PanPastels from Your Creativity Store. I hope the weather cheers up a bit, we are supposed to be going to a Jubilee picnic where my son lives, but I think it will be very dependent on the weather today. Have fun whatever you are doing to celebrate the Jubilee. Fantastic card, beautiful image and wonderful coloring. Loev all the details, especially the little angel. 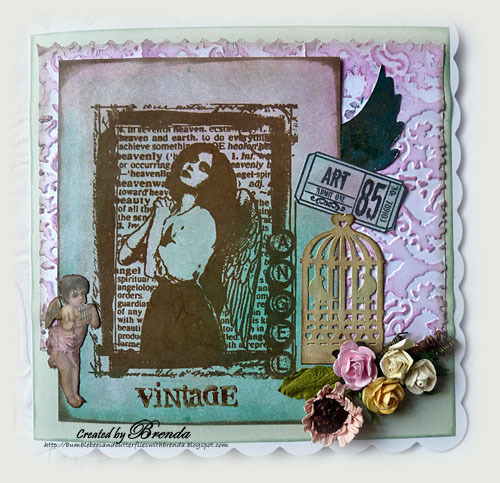 Brenda, I love your vintage collage which is so beautifully designed with wonderful images and soft colours. BRAVO my friend! Another fabbylicious project from you Brenda. FYI I've booked myself on a pan pastels workshop next weekend, with Kerry from PP - YAY! Brenda, this is a vintage beauty! Love the image, embossing and the little floral bouquet! Hope your weather will cheer up for you! Beautiful, Brenda! Love the wing, and that birdcage looks like it was meant to be a ticket holder... great idea! Fabulous Brenda, love that stamp and the colours wow ! you certainly know how to do vintage. Am loving my Pan Pastels but seem to be out of synch with the challenges but hoping to play real soon ! A gorgeous vintage creation Brenda - love all the detail and soft colouring. Your Jubilee celebrations went well, judging by the above Post Brenda - well done on making all that fab. bunting too! Beautiful creation..You are the queen of layers of beauty!